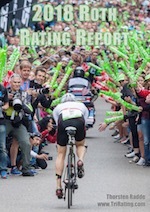 I’m working on a Rating Report for this year’s race. It’s going to be the best resource to look forward to Challenge Roth and to follow the Pro races on-site or via the Challenge live stream. The Report is going to be a 60+-page PDF with information about the race, all Professional participants and their chances on July 1st. You can already pre-order it here (or by clicking on the image on the right) so you’ll receive it as soon as it is released.